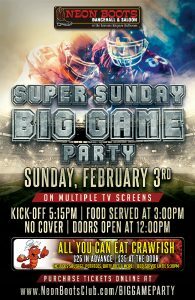 HUGE Super Sunday Big Game Party & All-You-Can-Eat Crawfish! HEY HEY the SUPER BOWL is coming up so get ready for the NEON BOOTS “SUPER SUNDAY BIG GAME PARTY WITH ALL-YOU-CAN-EAT CRAWFISH”!!! Tables on a First Come First Served Basis so get here early.